For any military historian, the topic of ninja remains one of the most fascinating mysteries of Japanese samurai warfare. The word ‘ninja’ or its alternative reading ‘shinobi’ crops up again and again in historical accounts in the context of secret intelligence-gathering or assassinations carried out by martial arts experts. Many opportune deaths may possibly be credited to ninja activities, but as they were so secret it is impossible to prove either way. Drawing of the archetypical ninja, from a series of sketches (Hokusai manga) by Hokusai, 1817. 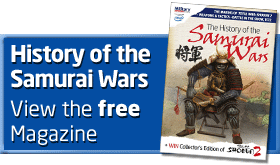 The ways of the ninja were therefore an unavoidable part of samurai warfare, and no samurai could ignore the secret threat they posed, which could ruin all his carefully laid plans. As a result, ninja were both used and feared, although ninja were almost invariably despised because of the contrast their ways presented to the samurai code of behaviour. This may be partly due to the fact that many ninja had their origins in the lower social classes, but their secretive and underhand methods were the exact opposite to the ideal of the noble samurai facing squarely on to his enemy. This paradox, that ninja were below contempt and yet indispensable, is a theme running through the whole history of ninja warfare. It is also fascinating to note that the popular extension of the image of the ninja to a superhuman who can fly and do magic also has a surprisingly long history in Japan. Such stories were being told as early as the beginning of the 17th century, when many of the historical accounts became mixed up with other legends. One of the best-authenticated uses of ninja occurs right at the end of the Sengoku Period in 1638 during the Shimabara Rebellion, when ninja infiltrated the castle of Hara. So ninja as undercover soldiers are indeed authentic, but the popular image of them dressed in black is probably no more than an artistic convention based on the traditions of the Japanese theatre. Most of the authentic accounts of ninja have them disguised as the enemy.